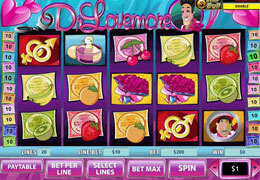 Dr Lovemore is a 5 Reel, 20 Payline Video Slot featuring a Wild Card, Scatter symbol, Free Spins and the progressive Dollar Ball jackpot. Dr Lovemore may not seem an ideal partner, but he can be rather entertaining in a stereotypical, sleazy manner on his quest to find love. Maximum bet of 200 coins with the option of betting between 0.01 and 0.10 coins per pay line. Wild Card substitutes for other symbols to complete winning combinations. 5 Wild Cards award the top Jackpot of 10 000 coins. The Scatter pays out whenever 2 or more appear anywhere on the screen. 2, 3, 4 or 5 scatter award 1, 5, 25 or 250 times the triggering bet respectively. 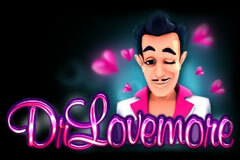 Pink Pants symbols appearing on Reels 1 & 5 award 20 Free Spins with 2x multipliers. 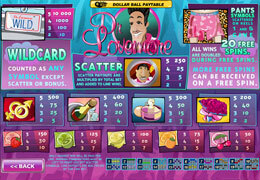 These Free Spins can be re-triggered if the Pink Pants appear again on the 1 st and last reel. Select 5 out of the 49 numbers presented. Guess the numbers correctly to win the Max Progressive Jackpot.